Customized Costa Rica Vacations, since 1999. Understated and Elegant, with Everything You'd Ever Need in a Luxury Hotel. On select travel dates! Details below. Get pampered in luxury and comfort in this unique hotel. Enjoy personalized service and 5-star amenities while you relax at the hot springs, surrounded by lush flora and fauna. Get up to 15% off on select room types. Valid for select travel dates between May 1st – October 31st. Save up to $133 per night, depending on the season. Rate per night does not include any discounts. Restrictions may apply. Nayara Springs, featuring 35 luxury villas, is a unique, exclusive boutique property with unparalleled personalized service and all the amenities of a 5-star resort. It is consistently rated as one of the best hotels in Latin America and the world*. It has been acclaimed time and again by travel industry professionals and is adored by all its guests. Every villa is a hidden oasis, tucked into lavish tropical gardens, with eclectic, colorful interiors and carefully designed details. The highlight of each villa is a private terrace offering spectacular volcano views and a chance to relax in your very own plunge pool. Once rejuvenated from soaking in the thermal waters of this spring-fed oasis, you can relax in the outdoor hammock or your lavish canopy bed overlooking the pool. As soon as you settle in your villa and are ready to decide on your activities, whether they are simple dinner and spa arrangements or any type of off-site activities, your personal host will be there for you to make it all happen. Anything you may wish for, just ask—if it’s in the realm of achievable, this is the place where you can ‘consider it done’. All the basics, such as A/C, cable TV, and safe, are covered, and then some. Rooms are equipped with a complimentary minibar featuring soft drinks, snacks, and selection of local beers and rum. The minibar is restocked daily. You have a choice of indoor and outdoor (paired) rain showers, and a towel warmer rack you never knew you needed before using it. Laundry is complimentary(! ), just let the staff know when you need it done. You can also enjoy the privacy of your villa during the breakfast. If you opt for this service it will be served on your terrace. On-site you will find a state-of-the-art spa, an open-air yoga pavilion with a complimentary class every day, complimentary birdwatching tour twice a week, an over-sized lap pool, the cozy Mediterranean restaurant Amor Loco overlooking the pool, and a sophisticated piano bar with live music nightly. New* additions to the property are an espresso bar where you can sample a variety of different Costa Rican brews; Mis Amores restaurant, serving casual Italian fare with many ingredients grown in the on-property organic garden; and a new pool with a swim-up bar and six in-pool tables with seating areas, a sun deck, and a covered terrace, both lined up with extra cushy lounge beds for couples. The new air-conditioned gym (already open) features floor-to-ceiling glass walls with views of the volcano and rainforest. 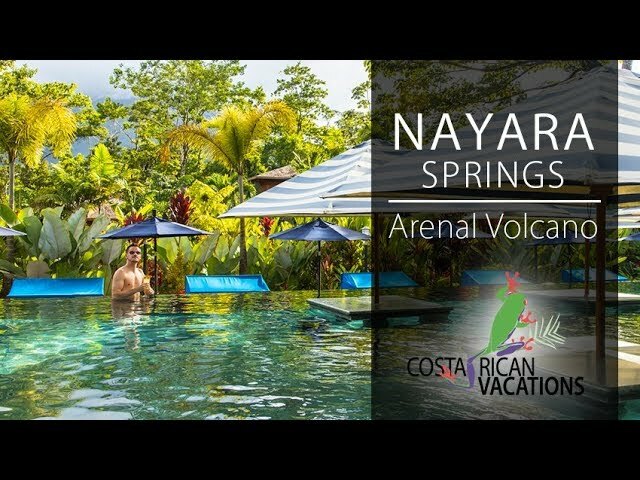 Nayara Springs is connected by two pedestrian bridges to the award-winning Arenal Nayara Hotel. Guests have access to the two restaurants. Altamira Restaurant, available for breakfast as a buffet option and also open for lunch and dinner. Asia Luna restaurant, a simply amazing dining experience—count on spending at least one night here! Also, a guest favorite, Nostalgia Wine Bar, with an impressive selection of wines you can sample by purchasing your wine card. The new area of Nayara Springs also features a primary rainforest trail below the canopy. Local guides lead morning birdwatching walks twice a week to spot brightly colored toucans, meandering tree sloths, hummingbirds, and interesting creatures such as the tent-making bat. *Ranked as the #1 Resort in Central & South America by CondeNast in 2016, and #1 Luxury hotel in the world according to TripAdvisor! *Prices reflect the least expensive rates during low season and are subject to change at any time. You will receive a 100% accurate price when you inquire with us and share your travel dates. Final package pricing includes taxes, domestic transport, tours and lodging as described unless otherwise indicated. The package does NOT include international airfare or optional travel insurance or any other services not expressly mentioned. Our friendly local experts will respond to your request within 5 minutes.